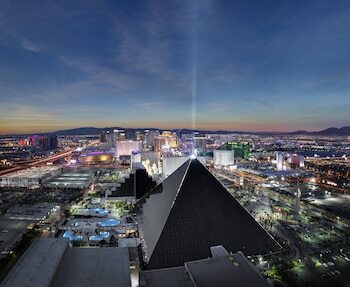 Once you have booked your Vegas hotel, you will of course need to get to Las Vegas. 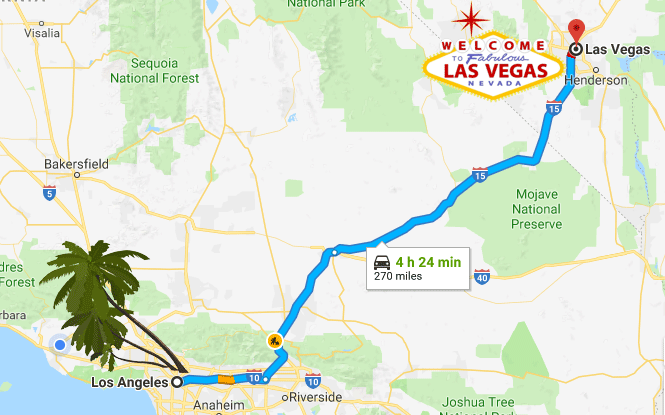 Many visitors going to Vegas come from Los Angeles, which is why we have put together our guide to traveling to Vegas from LA by car, plane, bus, shuttle, or limo and even discuss train travel. You will also find information about airlines, free ride offers, things to watch out for, and other travel tips. It is 264 miles traveling the highways from Los Angeles to Las Vegas. In between these two cities are miles of desert, attractive scenery, an old fashioned ghost town, fast food restaurants, historic route 66, an outlet shopping mall and some hotels along the way – Whiskey Pete’s, Buffalo Bills, Primm Valley, and South Point. Following all of the posted speed limits, the drive will take almost 4 hours. However, if you leave during very busy times, like major holidays, the drive time could easily double. There are also speed traps if you’re not careful. (I got my speeding ticket just outside of Baker, California). It is suggested that you allow 5 to 6 hours for the trip, so you can stop, stretch your legs and have a little fun along the way. If you consider that the average car gets somewhere between 22 and 32 miles per gallon on the highway, you will be spending about $30 to $45 one way for gas. If you have 2 or 3 passengers it gets much less expensive than having to buy 3 or 4 plane, or even bus tickets. On the other hand, you might have to buy lunch for some bored hungry passengers! You might want to rent a car before you go to save mileage and wear on your car (you will be driving through the desert). If you’re going on a weekend, know that there will almost always be traffic. However, even with traffic, one can usually drive to Las Vegas from Los Angeles in under 5 hours. It is about the same drive time from San Diego. Most visitors leave L.A. between Friday morning and very late Friday night, but everyone seems to head back to L.A. between noon and 8 p.m. on Sunday. As a result, the trip to L.A. is almost always slower than the trip to Vegas. If you can take Monday off and travel then, you’ll be traffic free. It is advisable to take some breaks every hour or so during the drive to make the trip easier. There are places to visit, such as a stop in Baker (try the Mad Greek for some of their yummy strawberry and date shakes) or stop by the Calico silver mining town in Barstow where you will find an authentic old West mining town that has been around since 1881, but is now a fun Ghost Town attraction. 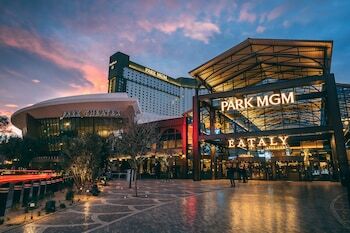 There are also some great outlet shopping malls, such as the Fashion Outlets of Las Vegas (40 miles south of Primm) on the way to Las Vegas. Enter the I-5 freeway going south. Keep slightly left and merge onto the I-10 East towards San Bernardino. 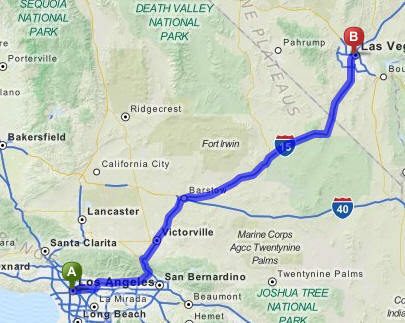 After about 38 miles, merge into the I-15 North towards Barstow for 223 miles. Exit Flamingo Road in Las Vegas then turn on to Las Vegas blvd. Click here or on the map below for more detailed mapquest driving instructions. Needless to say, time and distances will vary from other cities, but there will always be fast food restaurants, a vast hot desert and maybe some speed traps along the way. Some good mapping / driving direction sites are mapquest and Google Maps. If you plan on using a GPS unit, you may need to enter a specific destination address. 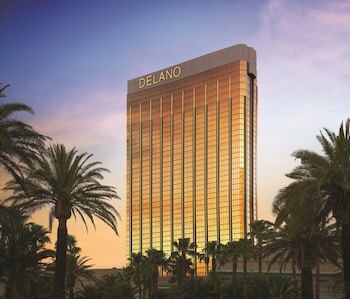 Mandalay Bay is one of the first major hotels you will easily see approaching the Vegas Strip on I-15 with its bright copper color windows. All the other Strip hotels are just a few miles north of it. 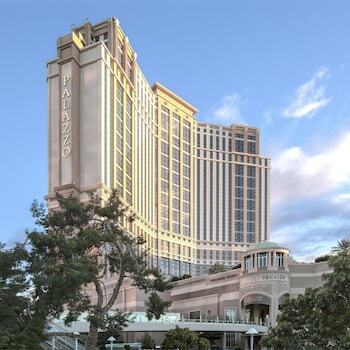 The address of Mandalay Bay is 3950 Las Vegas Blvd South Las Vegas, NV 89119. Since going to Vegas is so popular with people from Los Angeles and other nearby California cities, there are many bus lines that have regularly scheduled Las Vegas trips. One such line is Greyhound. They also have their Lucky Streak bus service that offers more discounted rates, but a less flexible schedule. Their buses are comfortable, air conditioned, and have reclining seats with foot rests. You even get free Wi-Fi and power outlets. Even though the buses all have restrooms, rest stops are made from time to time. The buses try to stop near a restaurant if it is close to meal time. Greyhound bus tickets cost as little as $19 one way with advanced purchase. It is suggested that you either make reservations for a ticket online or by phone, or arrive at their terminal 45-60 minutes early. Greyhound has many stations that go to Vegas and includes Anaheim, Los Angeles, Barstow, Phoenix, Claremont, Riverside, Compton, San Bernardino, El Monte, San Diego, Hollywood, Santa Ana, Long Beach, and Victorville. You should also be aware that the bus will only let you off at their downtown Las Vegas terminal. If your hotel is on the Strip (about 5 miles away), then you will have to make transportation arrangements, such as a cab or another bus, like the SDX (Strip & Downtown Express) which is easily done. You can find more info, such as fare details by visiting the RTC (Regional Transportation Commission of Southern Nevada) website. 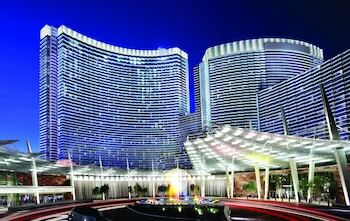 Plan on spending about $5 extra if you also need to get to a Vegas Strip hotel from the downtown area by shuttle bus, or you can save more with public transportation and don’t mind walking a bit. A taxi from the Greyhound station to a Strip hotel is convenient, but will be almost the same cost as your entire LA to Vegas bus ticket. An alternative to Greyhound is the GotoBus which runs buses from different locations in Los Angeles to Las Vegas and takes about 5 hours. The cost starts at $20 to $40 one way, with a $10 discount on round trips. The casinos in Las Vegas are anxious to get your business. 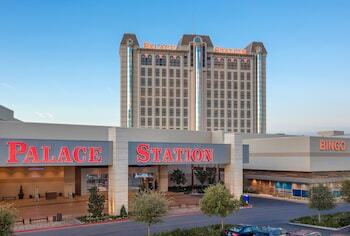 As a result, they will sometimes, but not very often, put together free or discounted bus trips to their casino. These may be advertised in the Sunday paper or at various social centers, such as senior center groups. However, you do not have to be a senior to go. You might also check with some of the bus companies that provide buses for charter groups. One often needs to ask around to find them. These trips are usually daytime affairs and return in the early evening. The only requirement for the trip is that you hang around and play at the sponsoring casino for a certain amount of time. Some of these junkets even give you some free gambling cash to get started, but there are minimum gambling spending requirements that are fully explained before you sign up for it. You can sit back and relax on a shuttle that departs from Los Angeles and Anaheim. 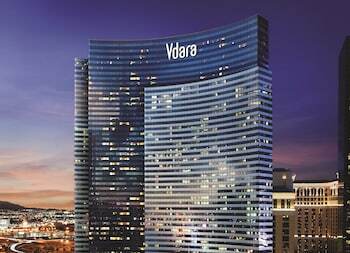 The trip is about 5 hours and will drop you off at Harrah’s which is conveniently located in the middle of the strip with inexpensive monorail service to most of the major hotels. They even show the latest movies, have complimentary snacks and beverages, reclining seats and on-board attendant service. However, it will cost more than Greyhound with prices starting at $58 each way. The shuttle makes only one trip each day each way, picking up and drop off in downtown LA, Hollywood, LAX Airport, Santa Monica and Beverly Hills hotels, and in Las Vegas at the Flamingo, California Hotel and Harrah’s. There is a lot to be said for flying to Las Vegas instead of driving or taking the bus. Putting aside the time spent going through airport formalities (searches, inspection, etc.) flying time is about 1 hour and 5 minutes. The price of roundtrip tickets can vary from $75 or less to $195 or higher. The price all depends on the airline and the date/time of your flight. For example, air travel to Las Vegas is cheaper in the summer time (because of the desert heat they are not as busy). Holidays when more people travel are always going to be more expensive. Vegas is home to some of the largest conventions in the world and traveling during one of these dates pushes up rates significantly. You can find a listing of major conventions here. It is often less expensive during the week than on weekends. Sunday night is an expensive time to fly since you will be coming back when many others are doing the same thing. Friday night can also be more expensive. 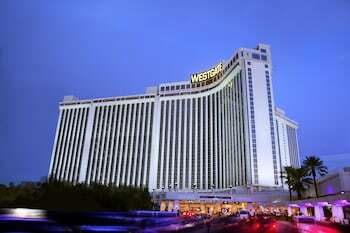 The Las Vegas airport, McCarran International, is about 5 miles from the heart of the city. 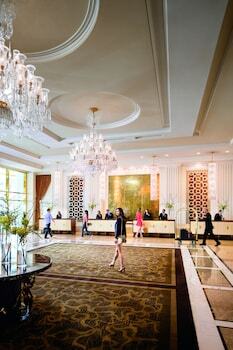 Cabs, buses, car rentals, limos and vans from specific hotels are all available. For around $15 you can take the Bell Trans minibus that goes to all the hotels, on the strip or downtown. It operates 7:45 am until midnight. In many cases, an air/hotel vacation package is cheaper than booking your own flight. One of the reasons is that the hotels often subsidize the cost in order to get more visitors to their hotel, so you wind up paying less compared to booking the hotel and air separately. However, this is not always the case, so it is best to compare booking your air and hotel separately compared to a package. 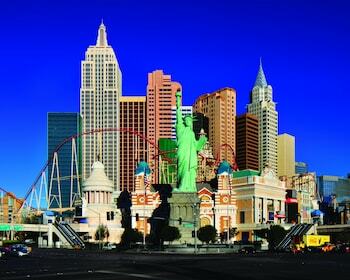 Las Vegas Direct Vacations specializes in discount Vegas packages and is worth checking out for an online quote. The X Train proposal calls for an Amtrak crew aboard a 576-passenger train that runs at standard speeds on traditional tracks. It would start in Fullerton, Calif. — already home to an Amtrak station and part of Southern California’s Metrolink commuter train network — and end in downtown Las Vegas. Tickets for the adults-only train would cost $99 each way and include a meal and beverage, with alcohol available for purchase. 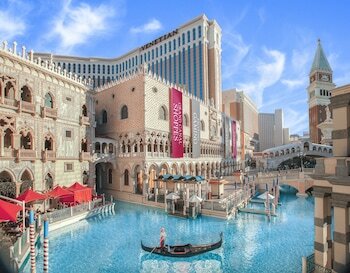 To keep ticket prices low, the company plans to make money booking Las Vegas hotels and entertainment for passengers. Initial plans call for a one trip a day on Thursday, Friday, Sunday, and Monday some time in 2013. The train ride will be designed to make you feel like you are already in Vegas as soon as you step aboard. Stay tuned. If you want to really live it up, one can arrange to have a limo (complete with bar) pick you up at your house and drive you to your hotel in Las Vegas. See our limo guide for details and prices. If you go with a large group and share the cost of the limo ride, the cost may not be as much as you think and can be be comparable to going by air on a per-person basis.